Shed Simove is an internationally acclaimed motivational speaker. He has presented countless keynote, motivational, and after dinner speeches to help people harness their creativity and fulfil their true potential. As a prolific entrepreneur and author, Shed knows how to innovate on demand. He doesn’t just know how to succeed himself – he knows how to teach others to achieve the same results. If you, your company, or your audience need a small push and practical tips on how to generate new ideas or increase sales, Shed is definitely the man to deliver them. Los Angeles, the home of Hollywood and Silicon Beach is the natural place for Shed to be drawn to as an entertainer and professional inspirational speaker. Shed is an expert in online marketing, guerrilla marketing, getting attention and how to innovate. Shed fits the LA brief of being a larger than life charismatic showman, whilst also delivering real, surprising and totally original business lessons. Perfect for Las Vegas Conferences or Conventions, Shed is a professional motivational speaker that will entertain, engage and inform your audience with a valuable keynote speech packed full of creativity, sales and marketing tips they can use to improve their success and bottom line. He’s very much the ideal Las Vegas Speaker, with a background in show business and audio-visual speeches that captivate any audience. The speaker circuit is full of inspirational speakers who specialise in blue-sky thinking and positive attitudes. Shed takes his motivation one step further and offers concrete techniques for coming up with great ideas to succeed in any industry and any position. 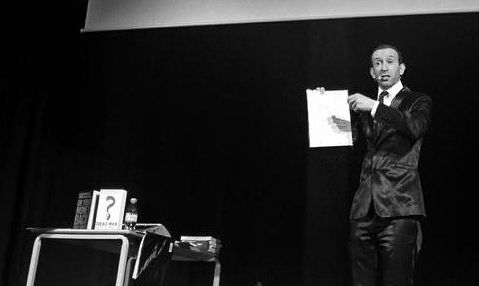 He has performed for corporate events and non-business people alike, energising every audience with his unique take on psychology, creativity, and business. He will take every audience through his amazing career and entrepreneurial adventures, using props and visuals to add depth to every story. Each anecdote comes with actionable tips to replicate his success and all speeches are tailored to the environment and audience. His speeches don’t have to stop there; after an instructive and motivational presentation, Shed can host an ideas workshop immediately afterwards to make the most of your audience’s inspiration and new attitudes. Your employees or delegates can use Shed’s techniques to brainstorm and solve problems – introduce innovation into your company in a single day and enjoy the rewards for years afterwards. Shed has been a featured guest on programmes such as Newsnight, as well as presenting his innovative speeches for clients such as eBay, Unilever, ITV, Channel4, Tesco, and more. He has performed his motivational speeches at hundreds of blue chip conferences and events worldwide, and has been invited to speak at the renowned TedX. Every idea is tried and tested, and even taken to market to achieve awards and best sellers the world over. Shed’s unique insight and hilarious presentation will change the way your organisation thinks.